​Bayern Munich face Schalke in the Bundesliga at the Allianz Arena on Saturday with both sides looking to get back to winning ways. Die Roten suffered a shock defeat last week at Bayer Leverkusen as three second-half goals from Leon Bailey, Kevin Volland and Lucas Alario consigned the reigning German champions to their first defeat in eight league games. As a result of this loss, Niko Kovac's side dropped below Borussia Monchengladbach in the standings to third and slipped further behind Borussia Dortmund, who extended their lead at the top of the table to seven points. ​Schalke's three game unbeaten run in the Bundesliga was brought to an end last week as they conceded two late goals at home to Monchengladbach following the dismissal of their goalkeeper Alexander Nubel in the first half. The Gelsenkirchen-based club are currently 12th in the standings and will be looking to gain some confidence ahead of their last 16 Champions League tie against ​Manchester City at the end of February. 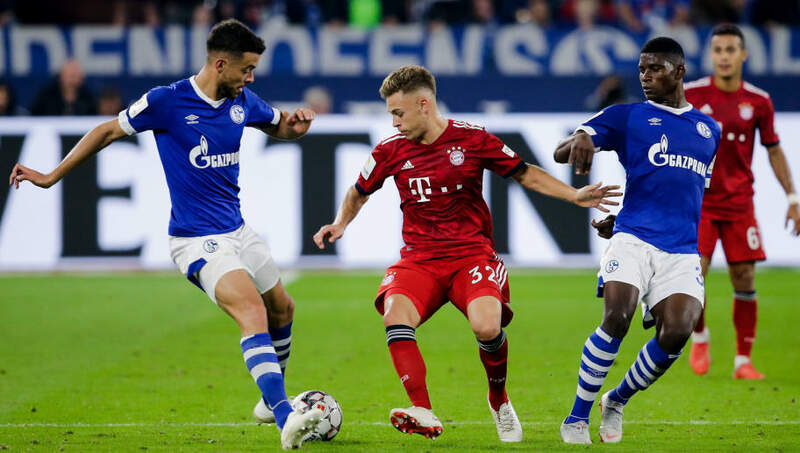 Whilst a win is imperative to Bayern's hopes of winning a seventh successive German title, Schalke may see Saturday's game as an opportunity to kick-start the second half of their season. ​Bayern will be without long-term absentee Clorentin Tolisso as the French midfielder continues his rehabilitation from a serious knee injury suffered in September. Goalkeeper ​Manuel Neuer is a doubt for Saturday's clash after missing Die Rotten's 3-2 victory against Hertha Berlin in the DFB-Pokal on Wednesday, whilst winger Franck Ribery is still not 100% match fit. Serge Gnabry could be given the nod ahead of ​Thomas Muller after scoring a brace in midweek whilst Thiago Alcantara is also expected to feature at the weekend. Schalke will travel to Bavaria without the likes of Breel Embolo, Steven Skrzybski and Alessandro Schopf who are all sidelined due to injuries. Goalkeeper Ralf Fahrmann is almost certain to start against Bayern and will replace Alexander Nubel, who is suspended for the clash after being sent off in last week's defeat to Monchengladbach. Forward Ahmed Kutucu may be in line to make his fifth Bundesliga appearance of the season after scoring in Die Knappen's 4-1 victory against Fortuna Dusseldorf in the DFB-Pokal in midweek. Bayern and Schalke have played each other on 106 occasions, with Die Roten winning 56 of their clashes whilst Die Knappen have been victorious 20 times. In the corresponding Bundesliga fixture between the two sides, goals from ​James Rodriguez and Robert Lewandowski ensured that Bayern would take home all three points from the Veltins Arena. A win for Schalke at the weekend would be their first over their rivals since December 2010. Bayern's recent form in the Bundesliga has been outstanding with Kovac's side picking up 21 points from a possible 24. However, last week's shock 3-1 defeat at Leverkusen snapped a ten game unbeaten run in all competitions, and saw the reigning German champions drift further away from current leaders ​Borussia Dortmund. Schalke have been experiencing a mixed run of results in recent weeks, winning two but also losing two of their last five in the league. Manager Domenico Tedesco has seen his side fail to reproduce the same kind of form that saw them finish second in the Bundesliga last season, as inconsistent performances throughout this year's campaign has seen them fall to twelfth in the standings. With Bayern averaging more than two goals a game this season, they will be confident that they can outscore their opponents on Saturday, especially when you consider that Schalke have kept just three clean sheets in the ​Bundesliga this season. Despite recovering well from a dreadful start to the season which saw Tedesco's side lose all five of their opening league fixtures, Die Knappen have yet to beat any of Germany's top four sides and face a mammoth task on Saturday if they are to buck that trend. In what should be a high-scoring affair, Bayern will prove to be too strong for their opponents at the weekend and will secure a vital three points to keep their hopes of a seventh consecutive German title alive. Prediction: Bayern Munich 3-1 Schalke.